Have you seen Furls Odyssey hooks are now available in smaller sizes? I’m tend to stay away from anything smaller than a 3.75mm because they are a bit difficult for me to manage and keep even tension with. That’s why I got really excited when the kind people at Furls let me try a D/ hook. I’ve also had my eye on Red Heart’s Sizzle for a while so I came up with this little coin purse. You can view this pattern below for free or you can purchase a PDF to print free of ads. Approximately 3” tall by 2.75” wide. 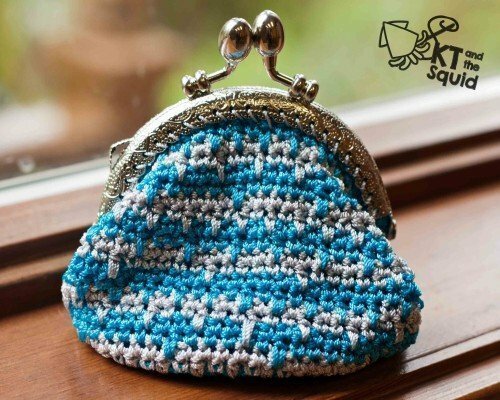 This coin purse is worked in the round, do not join at the end of each round with 2 strands of thread held together. Use a stitch marker to mark the first stitch of each round. To change color work to the last step of the last stitch before the color change, complete the stitch with the new color. You will only need 1 spool of each color but because you will need to hold 2 strands together you’ll either have to use 2 spools or unwind about 60 yards. Spike Half Double Crochet (Shdc): Yarn over, insert hook into st indicated 1 row below, yarn over, pull through all loops on the hook. Use two strands of thread held together throughout. *Move the stitch marker to the first stitch of each round as you go. Fasten off, weave in all ends, sew on purse clasp.